IT'S TOFFEE'S TURN: UMNO's top Espionage Agent - Hadi Awang fights back. UMNO's top Espionage Agent - Hadi Awang fights back. Did the UMNO sanction the Hudud move in Kelantan? 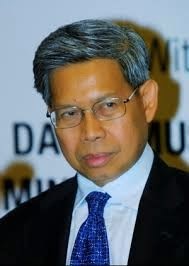 When asked this question by the press Kelantan Umno head Mustapa Mohamed began speaking "UMNO" ( the language of deciet) that is, to steer off the issue give answers that do not make any sense but refuse to deny or admit that UMNO had in fact sanctioned PAS Hudud move as claimed by the PAS membership. Since Anwar's attempt to move into the Kajang seat PAS had been behaving very differently towards the Pakatan rakyat coalition they are part of, the party showed that it was more inclined to agree with UMNO then with Keadillan and Pakatan as a whole. Even after a decison was made to have Wan Azizah become Menteri Besar this man in particlar Hadi Awang and his associate Harun Din were adamant about not letting it happeneven though PAS members in the Selangor State assembly supported the move. Hadi was uncomfortable with Anwar becoming MB for one reaosn that would have brought him closer to Putrajaya, because he, Hadi has always been vying he position of PM or oppostion head at least and wanted Anwar out of his way. It is believed that the Kelantan Hudud deal was hatched with Najib if Hadi supported him in making sure that Wan Azizah did not become Menteri Besar of Selangor. 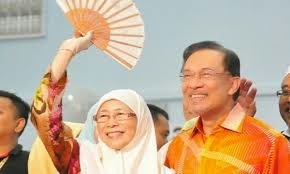 A woman MB or for that matter a PM is not in UMNO's DNA that is why they removed Rafidah so ungracefully , the best Minsiter in the psot Mahathir Cabinet.There was also talk about coopoeration between the two parties headign towards the next General elections. These claims that the Hudud was given the backing of Najib is now becoming clearer by the day in fact there are others who had actually said it was initiated by Najib and this is not strange to believe, rememebr UMNO Selangor wanting to table a similar motion in the Selangor State assembly? Whilst Najib is "quiet" both he and Hadi have hatched the paln. the plan was toe use Hudud to split Keadillan and that is exactly what Hadi is now set out to do withthe blessings of Najib. The UMNO paln is working to perfection, and Hadi is the , "Chief of UMNO's espionage division," whilst PAS is being turned into UMNO's Islamic wing. Hadi's job now is to use religion and confuse the memebrs of Keadillan Rakyat to support his cause and in the process if he can muster enoiugh support UMNo will prvide the rest to ensure the Kelantan Hudud introduction becomes a reality. Now Hadi has targeted PKR's Muslims memebrs of Parliament, in his latest call to them to listen to him and not be parrots, Hadi has trained his guns to the more gullible Pakatan MPs' and membership at large to confuse them into believing htat this is indeed a call of God and a sacred duty. We all know how easy it is to confuse Muslims it has happened in PAS and in UMNO and now Hadi is continuing the mission and taking it into Keadillan. If Anwar were around Hadi would have walked out with his tail between his legs, but now that Anwar isout of the way - jailed, one begins to ask; was Hadi in that game plan too? That is jailing Anwar so he could execute this UMNO plan. A careful look at the events may reveal that he well could have been. Many Malay Muslims just like Muslims elsewhere can be confused,if the seeds of that confusion come from sources they perceive to be authoritative and that is no secret, even over an issue like Allah they could confuse the whole nation or at least a substantial part, when the entire remaining Islamic world views what they have done as stupid and ridiculous it has happened in Malaysia, that is how gullible a good number of Muslims are? Maybe they do not fall into the majority, but the ones that subscribe to these sometimes ridiculous teachings are so voiceferous that the other Muslims just choose to remain silent for fear of reprisals. Najib has remained silent and does not even talk about the issue, heprefers to work with Hadi from behind the scenes, all this Hudud bit is being done to undermine the charge agaisnt him by Mahathir Mohammed, and because of the religious factos behind the whole issue both Mahahtir and Najib have decided to keep quiet waiting for the other to make the move, although Najib is fanning the flames from behind to see if Mahathir makes the wrong move so he can wipe him out without even having to lift a finger. This espionage excercise is multi pronged, it has firstly to break up Pakatan Rakyat once, that is done Najib will find it easy to deal with Mahathir he will not be a pain anymore, Mahathir will become history so will the 1MDB and all other scandals, Altantuya will be laid to rest because it is not too big a crime to kill a non Muslim. Getting Keadillan to split with DAP is the primary objective and in this respect many a Keadillan man becomes suspect, once that is done the war between Keadillan and PAS will begin and that will create fighting between alliance partneres and the Malay vote will be split and PKR will never be what it is today. out and Najib did him the favour, now he Hadi assumes he is seen as the biggest power in Pakatan, but DAP has him plugged if he gets Keadillan's MP's on his side he'll move to kick DAP out. So what's up with this move. It gives the PAS semblance of crediobility with its membership and supporters, it will show that PAS has lioved to its promsie of an Islamic state this is beiung done because, in governance and performance they have not come anywhere near the Pakatan in Selangor and Penang both non PAS states extremely well goveremed, so with this they hope to raise their image as an effective party, but what PAS does not realise is a substantial part of the Malay vote they received were actually Keadillan's and not theirs.PAS never came near to its present performances prior to joining Keadillan. Well of course to UMNO if hey damage Pakatan they ahve no one to answer to for all their sins, corruption, nepositsm, the 1MDB and all other events, it gives UMNO a free ride. If Keadillandn the DAP move and decide to sack PAS their alliance will become stronger. PAS will be forced to field candidates in UMNO areas where even UMNO will be in and in so doing will split the Malay vote into three only to see a Keadillan victory or UMNO will be forced to accept PAS into Barisan, a move that may not be acceptable to its other members, but do the other members really have a choice if UMNO decides. Keadillan and the DAPmsut act now or at least till after the Parliamentary vote on Hudud, and prepare sufficient candidates for the next General elections, as PAS may pullout at the eleventh hour, no pointhaving PAS ge trid of them and beign the new push, with such a corrupt governemtn it is easy to take over Putrajaya. Hadi Awang is most certainly an UMNO mole stationed in Pakatan with special instructions to carryout "Operation Hudud" and split the party.